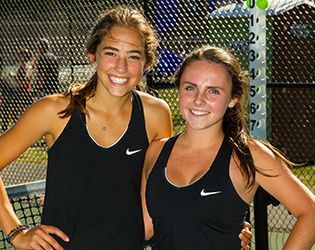 At yesterday’s NJISAA Prep B team championship, the varsity girls’ tennis team claimed first, along with Montclair Kimberly Academy and the Ranney School. Each of the teams recorded eight wins over the course of the tournament, ending in a three-way tie at the finals. Gill entered the finals with seven points, followed very closely by Ranney with six and Montclair Kimberly with five, not including an unfinished match at second doubles that was completed yesterday as well. Ranney took first and second singles yesterday, and Montclair Kimberly claimed third singles and second double, as well as notching a win for the previously uncompleted match at second doubles. Thanks to a win at first doubles, courtesy of Martine DiDomenico '17 and Andree Aloise '19, Gill was able to tie for first. When asked about the win, head coach Chris Walsh said, "Based on all the hard work, conditioning, and overall enthusiasm I have seen since August 15—the first day of pre-season—the girls were ready to compete. All 24 girls were there every day, and the leadership from the senior captains proved to be the key to success."